Transfer Note: Two sequences copied at 19 frames per second from a 16mm color and black-and-white print preserved by the National Air and Space Museum, Smithsonian Institution. New Music: Martin Marks. Running Time: 7 minutes. This 1936 home movie of the German dirigible Hindenburg was taken by a vacationing American family. The now unidentified group must have been among the only five hundred passengers who made the ten trips from Frankfurt to New Jersey during the Hindenburg’s single year of operation. At 804 feet long, it was the largest rigid lighter-than-air craft ever constructed and could reach eighty-four miles per hour with the four diesel-driven propellers seen in the footage. Captured by the amateur filmmakers are the elegant dining room, observation salon, and control gondola. As was a practice in early home movies, the family edited in intertitles (commercially produced from text supplied by filmmakers). 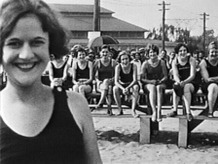 Less common in the thirties is the brief color footage also edited in. Both films were preserved in 1999 through Treasures of American Film Archives funding.